Tampa Personal Injury Lawyer re-launches one-of-a-kind ‘Minute With Mike’ Video Series on YouTube to encourage legal discussion in the bay area. Recently Blick Law Firm was publicized in over 40 media and newsrooms outlets, discussing the firm’s venture in giving legal advice through videos on YouTube. Credible sites mentioned the firm such as, Digital Journal, a digital media news network with thousands of Digital Journalists in 200 countries around the world. Other news outlets to mention: The Bull Reporter, 760 AM Talk Radio, The State Journal – Online and WBOC- TV (DT2 – FOX) were among the many to publish the law firm’s video series. 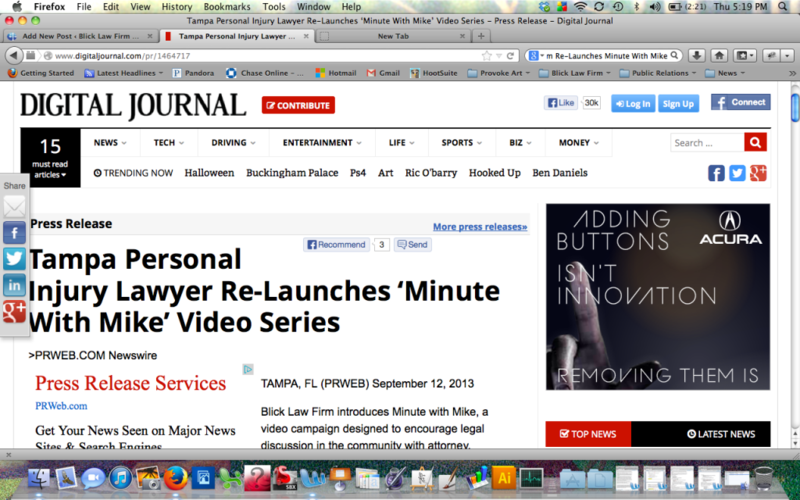 Blick Law Firm introduces Minute with Mike, a video campaign designed to encourage legal discussion in the community with attorney, Michael Blickensderfer. The campaign re-launched August 5th, 2013 and has taken YouTube by storm. Within its short inception the YouTube channel has reached over 100,000 Views! Minute with Mike campaign’s objective is to bring awareness to the community of Blick law firm’s services, answer legal questions online and offer commitment to the local community. “Blick Law Firm wants to give back to the community by offering a site where people can go to get legal questions answered for free without the inconvenience of leaving their office or home,” said Dana Blickensderfer, marketing director at Blick Law Firm. Submit important legal questions by emailing info(at)BlickLawFirm(dot)com and see the questions answered by the attorney. Blick will try to answer legal questions based on the firm’s practice areas, but cannot guarantee every question will be answered. Blick Law Firm is a local Tampa Bay legal firm specializing in personal injury, criminal, immigration and real estate law all across the state of Florida. The owner, Michael C. Blickensderfer has 25 years legal experience in Florida, New York and New Jersey. Blick Law Firms practice areas include criminal law, DUI/ Traffic, real estate transactions, loan modifications, short sales, foreclosure defense, bankruptcy, title insurance and real estate litigation. Blick Law Firm also serves clients in personal injury, including auto accidents, motorcycle accidents, slip and falls premises liability, dog bites, marine and aviation accidents and wrongful death. *Disclaimer* The hiring of an attorney is an important decision that should not be based solely upon advertisements. Before deciding, ask the attorney to send free written information about the firms qualifications and experience. Copyright © 2013 by Blick Law Firm. All rights reserved. In the state of Florida, drivers must carry certain types of insurance coverage. The insurance coverage most likely to be included in your plan is [PIP] Personal Injury Protection and Property damage Coverage; bodily injury may be required. In Florida, you are not required to have liability coverage, although it may assist in your recovery in the event that you are involved in an auto accident. It is important to know that if you are involved in an auto accident with an uninsured or under insured driver, compensation for your injuries may not be available. Therefore, it is important to protect yourself by carrying proper coverage; including [UM] uninsured motorist coverage. UM or uninsured motorist coverage provides protection in the event you are involved in a hit and run collision or rear-ended by a driver that has bare to minimum coverage. Carrying UM coverage ensures that you and your loved ones are able to get the proper compensation for your injuries and the medical treatment necessary for your recovery. You should ask your insurance company about adding UM coverage to your policy. In the event that you have been in an auto accident and need legal representation, call today for a free case evaluation with attorney, Michael C. Blickensderfer or call us at 813-931-0840. Additionally, you can visit us online at www.blicklawfirm.com. Our Personal Injury Lawyers will guide you in your injury claim or lawsuit. Blick Law Firm specializes in the practice of personal injury law with over 25 year’s legal experience. Attorney, Michael C. Blickensderfer is licensed in the entire state of Florida, New York and New Jersey. As well, Mr. Blickensderfer is a former prosecutor and former marine operating a Christian-based law firm in the Tampa Bay Community. Regardless of the type of injury you are involved in when filing a personal injury lawsuit, it is important to know what your injuries have cost you and the damages that you could potentially be awarded. In personal injury cases, one is entitled to compensatory damages, which are compensation or restitution for the harm sustained by the plantiff, both monetary and non-monetary losses. What are monetary and non-monetary losses? They include but not subject to: medical expenses, lost wages, repair of property and funeral expenses. Non-monetary losses include: pain and suffering, emotional distress and alike. In a personal injury case, you should obtain a Tampa personal injury attorney that will represent your legal rights and get you the financial assistance you deserve. There are NO FEES, unless you get paid. Call Blick Law Firm today and ask about our legal services! 813-931-0840. Think quick, call Blick! As Gasparilla quickly approaches and work today seems to be going by so slow, take a minute to reflect on the weekend ahead. Gasparilla means crowds, pirates, beads and if you are of age, drinking. With the craziness that Gasparilla brings to the Tampa Bay area, it is important to go in educated on proper safety precautions to take for you and your loved ones. Arr, you ready?! As an automobile/motorcycle driver know that the Gasparilla parade route extends alongside Bayshore Boulevard and continues through downtown Tampa on Brorein Street and Ashley Drive. Most pedestrians will be located on Bayshore Boulevard while the parade is underway, but all parade attendees are expected to park in the downtown area prior to arriving for the events festivities. Watch for pedestrians, they have the right of way. Slow down your vehicle at all crosswalks to avoid any collision. The crowds will be swarming with people; anyone can mistakenly walk around without looking both ways. Be a step ahead and drive on high alert! Use turn signals! Use signals to notify other vehicles and pedestrians of you intended route. Never assume another driver will yield right-of-way. Avoid aggressive driving! Keep special attention at intersections where there may be turning vehicles. Keep to walking in areas of well-known pedestrian routes. If there are no sidewalks, walk facing traffic as far to the left as possible. If you find yourself involved in an unexpected accident and you are not at fault, call your Tampa Bay personal injury attorney! Contact Blick Law Firm immediately so that we can assist you with your legal needs. 813-931-0840! Think quick, call Blick!